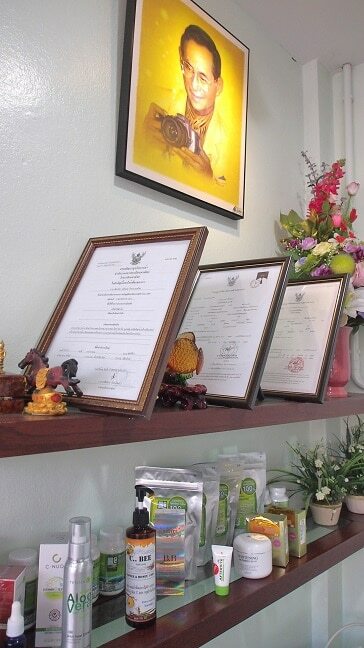 The newest private acupuncture clinic in Chiang Mai where English is spoken is now Patsa Clinic at the Moon Muang road near Sompet market. 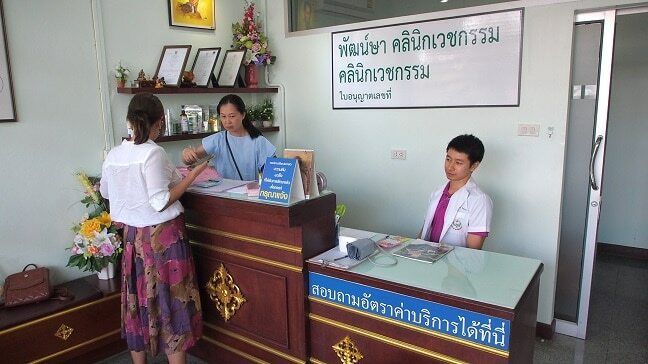 On my second trip to Chiang Mai in the end of 2016 I went to see it again to have better glimpse of what they are doing and was positively surprised to find out they have added some general health check options like blood tests and minor anti-aging modalities like high dose vitamins and anti-oxidant infusions and facial acupuncture for cosmetic purpose. Infusions contain vitamin C and B-complex and NAC. 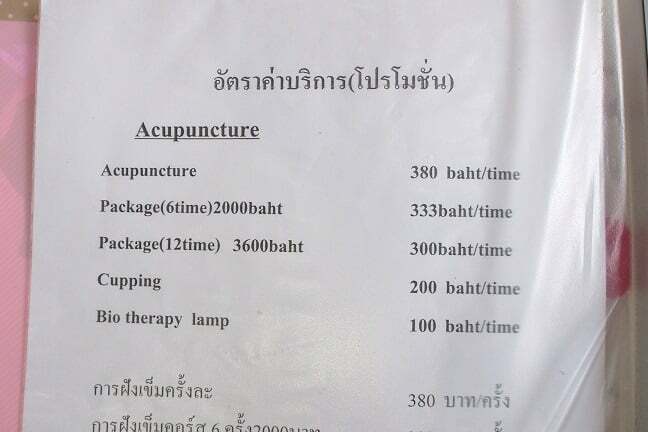 Although the B-complex that many places in Thailand seem to offer consist only B1, B2, B3, B6 and B12, not the full spectrum. Also allopathic drugs, prescriptions and wound dressing are available. Even vaccinations and contraceptives. One that picked my eye on the price list was “anti-hangover treatment”. So if you are party-goer, this may come in handy on the next day:-) I suppose it consist of high dose NAC(Acetylcysteine). I forgot to ask what’s in that. The same acupuncturist doctor who previously worked at TTCM is also having service hours at Patsa, so they are not hobbyists. In addition to her and the CEO Piang Pit there was also another male doctor Itti Arjhan doing mostly facial acupuncture and the vitamin infusion. 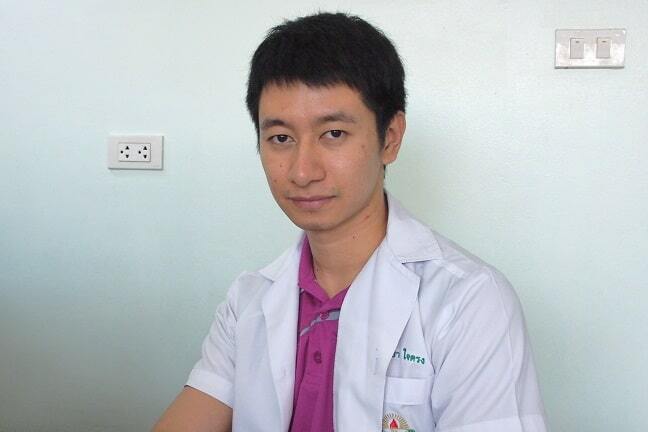 He is graduated as general physician from Chiang Mai university and holds service hours at Rajavej Hospital during the day time. In the afternoon he comes to Patsa, but in terms of acupuncture he is not qualified for more than facial treatments. 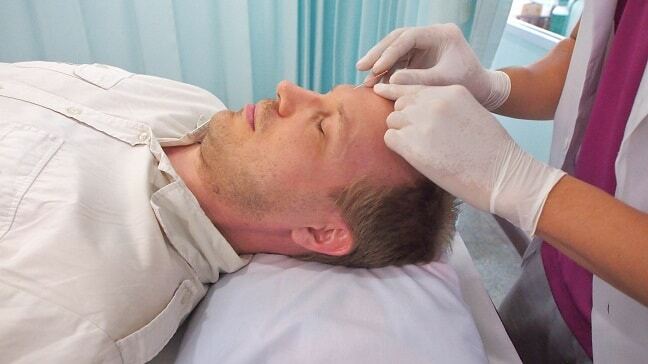 I got to experience the facial acupuncture which, besides few other points, utilizes the same point in the forehead between eyes that is used for ayurvedic shirodhara and I felt kind of same effect that many people describes how shirodhara feels like. The vitamins and NAC which I was given had soothing effect too. The shot consists of 2000mg Vitamin C, 600mg of NAC and the B-”complex” which exact amounts I am not sure of. 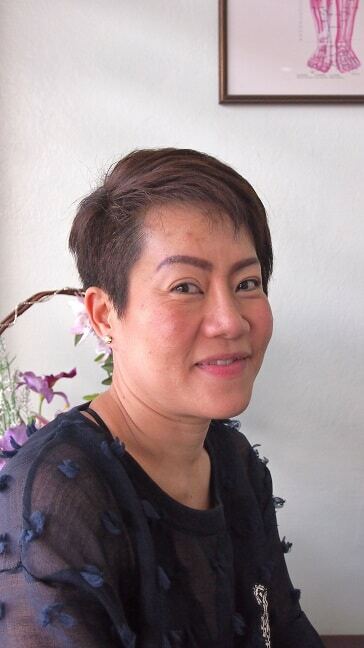 Happy regular customer Mrs.Tip after facial acupuncture and vitamin and antioxidant infusions. At the time of my visit there was one patient, Mrs. Tip who was very happy of the new set of treatments Patsa offers. She comes over once in a while to receive the infusions and facial acupuncture that helps her to feel and look younger. Facial acupuncture improves blood circulation in facial area and it may appeal to women who are concerned of wrinkles and other typical age related cosmetic issues. Their pricing is from the lower end. 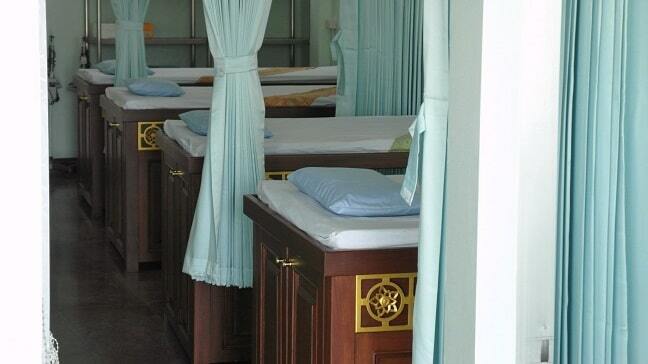 One acupuncture session costs only 380 THB and discounted packages are available. 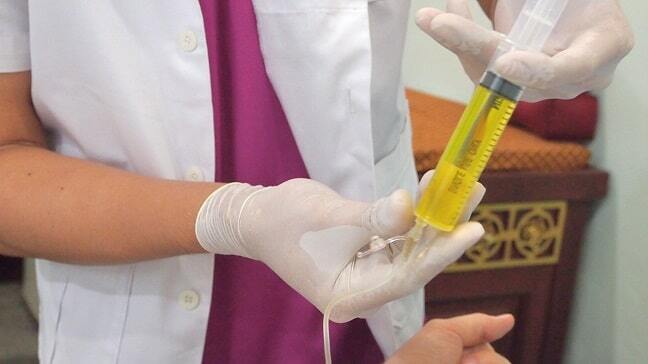 Vitamin infusion is 300 THB and doctors consultation fee 100THB. 50 meters from Sompet market to north. Right next to Medical Supplies Warehouse that you see on the map. Click to see street view.